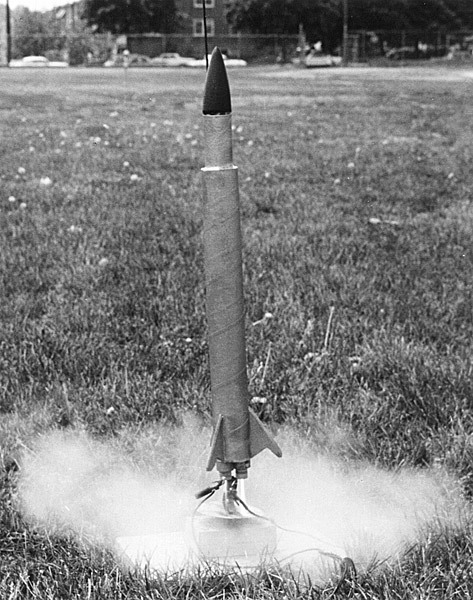 The Journeyman as it blasted off on June 7, 1969. This is the only known picture. The Journeyman was built by Joe Jones in the summer of 1969 and launched once. I've seen the above picture, taken by Joe, off and on over the following 45 years. There is a copy in the ARO log book and of course Joe had a copy, which is where my copy came from. Back then we developed and printed our own film. The above photo was taken at Simon's Recreation Center (the "Rec") in the West Oak Lane section of Philadelphia. The ARO, which is short for "Aerodynamics Research Organization," was created in April of 1968 in Joe's basement with Joe as the president and Jimmy Nolen and myself as secretaries. There were a few other loose members, namely Jeff Sidewater, Mike Kaplin, Clifford Eike and a kid on Joe's street named Ronnie Fisher. 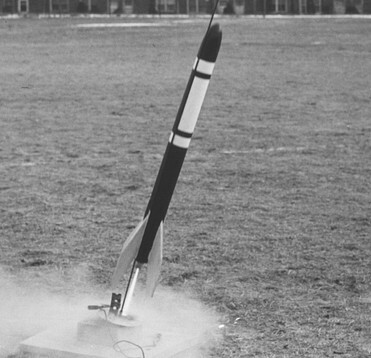 Our first launch was on April 10th, 1968. We were in 8th grade. April 10, 1968 was a Wednesday, so we were on Easter vacation. It was 65 degrees out and we launched for 1/2 hour, from 12:20PM to 12:50PM. We launched the Alpha, Arcas, Skyhook and the Gyroc, all of which belonged to Joe. 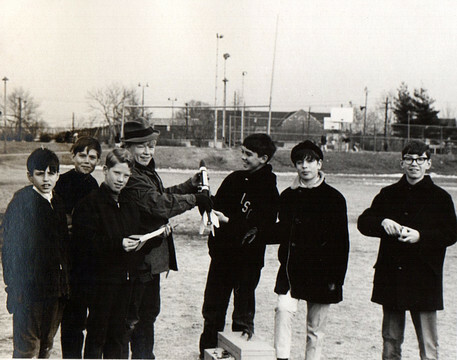 When Jimmy and I met Joe in 1968 he was already president of the West Oak Lane Rocket Launching Society; "W.O.L.R.L.S," pronounced "walrus." 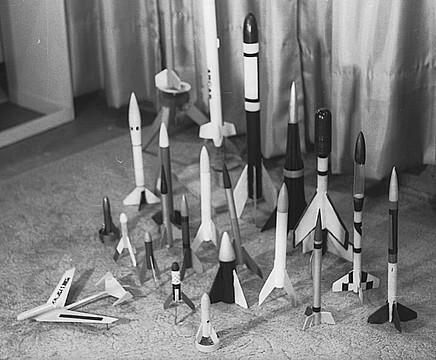 At that time he was the only one with any rockets so it was natural he was president of the new club. As a matter of fact, Jimmy and I didn't know anything about rockets till Joe showed us. Joe also showed us how to make block busters and cherry bombs, taught us how to develop film and make prints, and was the first one of us to have a CB radio, and then a Ham radio station. 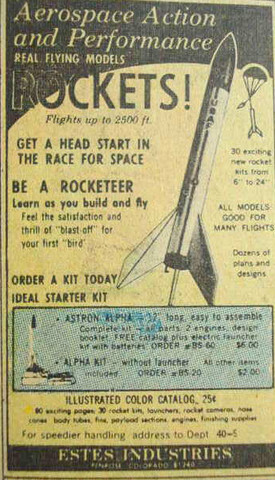 I had seen these ads in the back of Popular Science, but never thought you could actually build a rocket at home. Rockets were, like, 300 feet tall and we lived in a row house in Philadelphia. I sent an order to Estes Industries the very day of the first launch. Here it is dated April 10, 1968! Click on it to see full size. 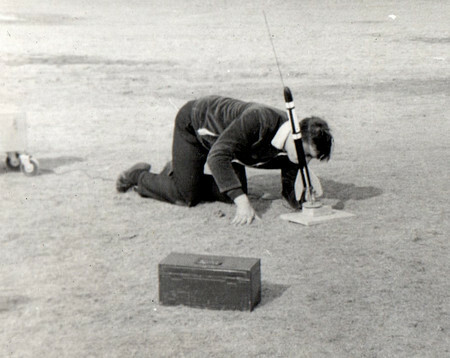 We had 14 launchings in 1968, including one on April 26th where the only rocket launched was the Streak I ordered on April 10th. Photographs from our 1968 year are rare, as I didn't have a camera and Joe lost a lot of stuff when his house was flooded in 2000. The pictures below are from January 17, 1969. Joe preps the Big Bertha at Simon's Recreation Center. Jimmy Nolen is third from the left. Yours truly is at far right. Our fleet in April of 1968. All but a few belong to Joe. 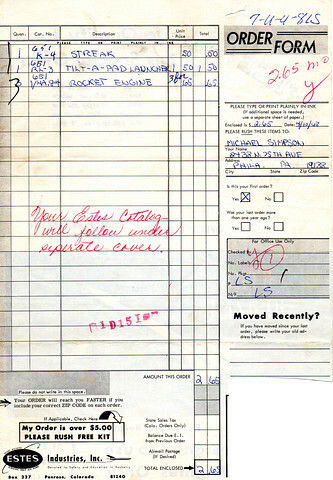 Here is the "Streak" I ordered on April 10, 1968. It was launched on April 26th but I never got to see it. Though I had been to my first launch just two weeks before, the rockets were relatively large and the engines used were relatively small. Not having much money, I selected the Streak because it was the cheapest rocket in the catalog. I didn't realize it was also the lightest, and used for altitude contests. Maybe it was because I was standing so close to the pad, or maybe because I blinked, when the Streak took off it seemed to vanish in a puff of smoke. I mean it literally just vanished. I remember looking at the pad and wondering what had happened, as my little rocket that I had so carefully assembled and painted had turned into smoke. It took me two whole seconds to realize it was in the air, but when I looked up I didn't see anything up there. Neither did anybody else! Well, it had to come down in a minute, right? We searched the field and never found it. It really had vanished. Years later when we were in our 20s one of the biggest contributing members to the ARO was a guy named Bob Priess, nicknamed "Stripes." Bob supplied us with something called "denominations of currency" and bankrolled our adventures. He was also an expert at RC model plane construction. Bob and I both won the Estes "Design of the Month" contest and we each used our winnings to purchase the mother of all kits, the Saturn V.
April 10th is the official anniversary of the ARO. Joe, Jim, Cliff, Bob and I are still around, 46 years later (as of 2014). Thanks to the Internet we stay in touch. I recently got the urge to recreate the Journeyman and I wanted it to be the same size as the original. 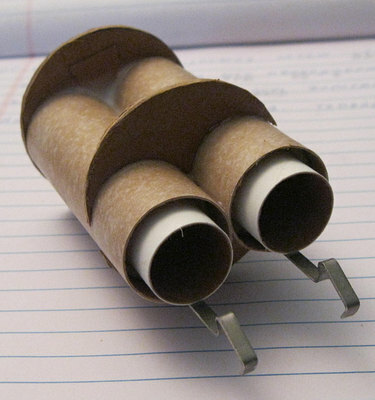 Through a few emails with Joe I learned it was built from scratch from a paper towel tube, a tube from some Christmas wrapping paper, engine mailing tubes*, etc. It had a home made nose cone. Everything was centered with glue soaked paper towels. It was painted metallic green and silver with a flat black nose cone. It weighed exactly one pound with engines. 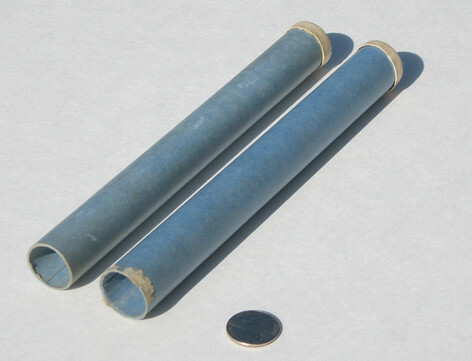 * Engine mailing tubes were very hard, blue colored tubes that Estes Industries shipped their engines in. These two are from 1969 and are exactly the same as the ones in the original Journeyman. A quarter is shown for size comparison. How big was this rocket? 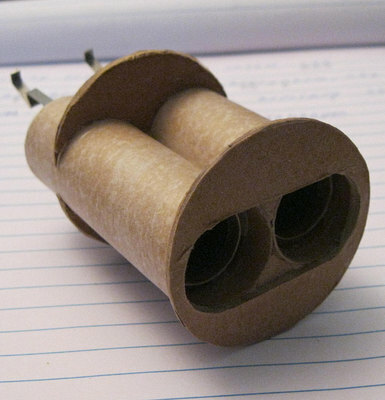 A clue to its size - a paper towel tube was used. What do we do with that? Get out the calculator? Nope. 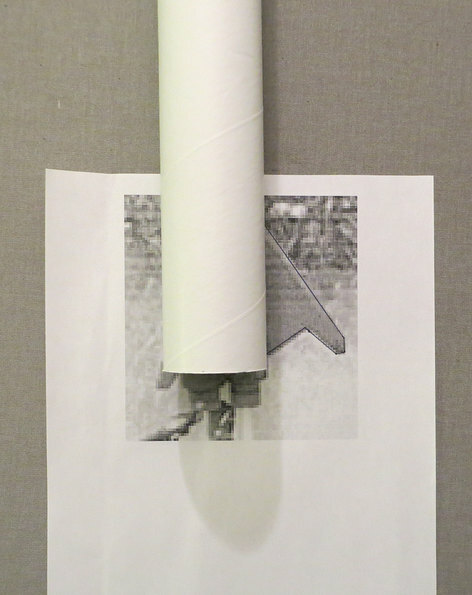 Print a picture whereby the upper rocket is the width of a paper towel tube in the picture, and take measurements. 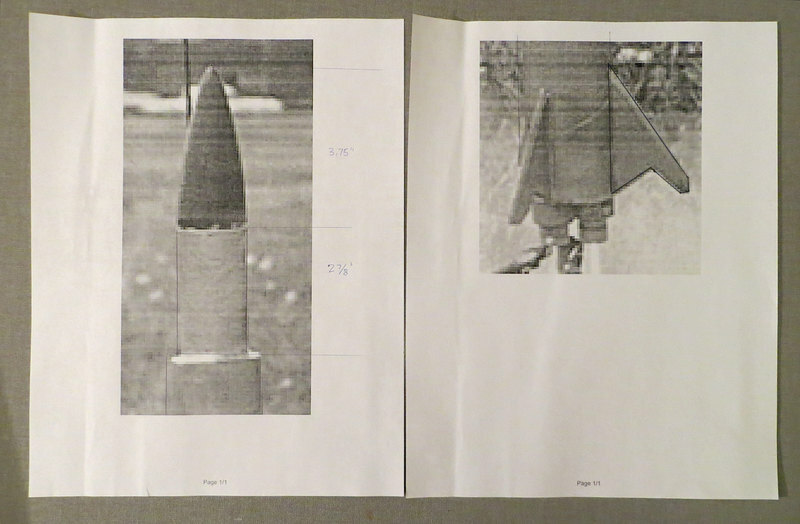 Then, using the same print size, print out a picture of the bottom of the rocket so the size of the fins can be determined. 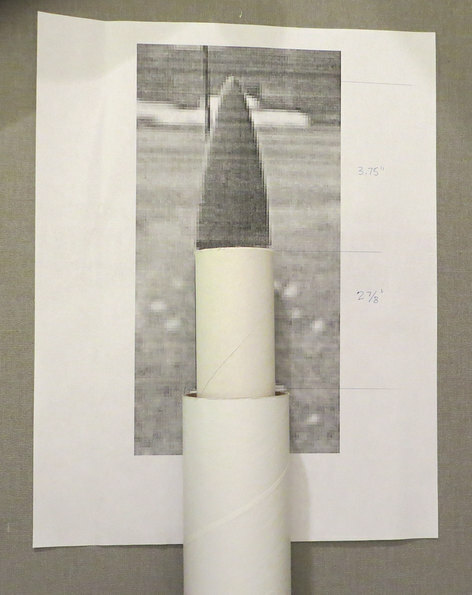 Using a ruler to measure the top of the rocket in the above print, the paper towel tube measured a little under 3" long and the nose cone was 3.75" long. 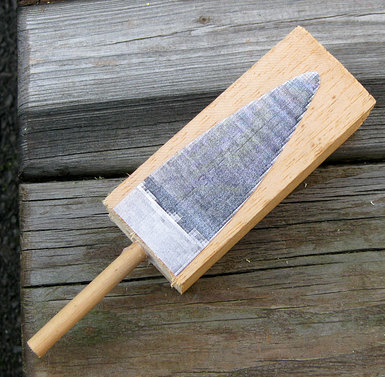 The dimensions of the fins were also measured. How long was the large body tube?? is .75" across and 6.25" long. We get the ratio of length to width by dividing 6.25 by .75 = 8.33. 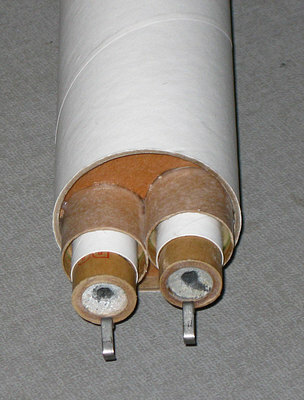 The actual width of the large tube (a UPS mailing tube) is 2". 2" x 8.33 = 16.66". I made the large tube 17" long. 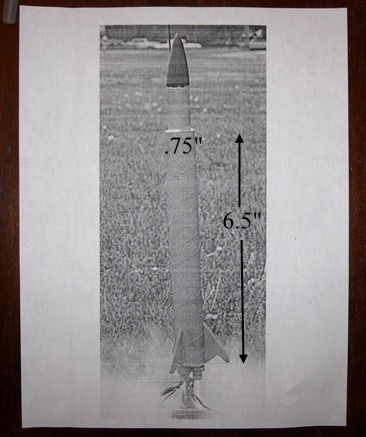 The entire rocket is approx 23.75"
long, just under two feet. 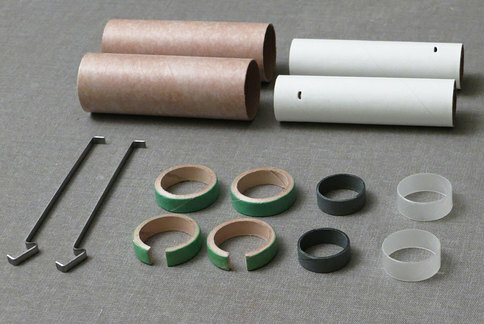 The appropriate size tubes are lined up on the photo. Very high tech. Now it was time to get to work! genuine engine holder assemblies to keep the weight down. The large centering disks were home made. These will each take a C6-3. Installed in the lower tube, they resemble the rear of a Titan missile. and three with the grain in another direction. Glued together they are very strong. 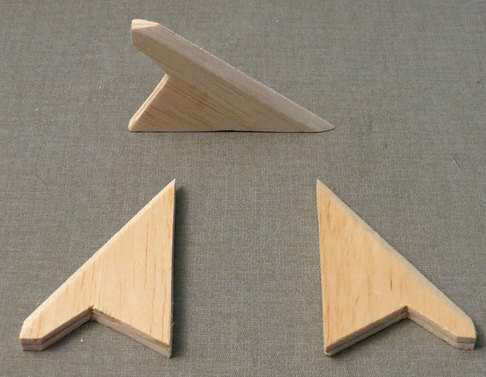 from a block of balsa wood, donated by Joe himself.